The sale signs at Saks may apply to more than its clothes, and Sony considers a big move. The Dow industrials (^DJI) rose 52 points yesterday and the S&P 500 (^GSPC) edged up 2 points -- both closing at record highs. The Nasdaq (^IXIC) added 5 points. 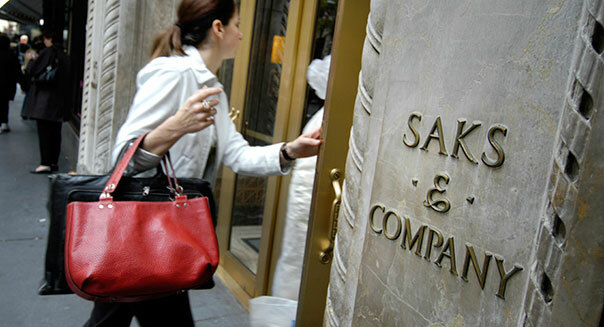 Shares of the upscale retailer Saks (SKS) are set to rally for a second straight day. A report circulated late yesterday that Saks had retained an investment adviser to review alternatives, including the possible sale of the company. Sony (SNE) is set to jump on a report that it may spin-off its movie and music division. A Japanese newspaper says the company is leaning in favor of the proposal floated last week by activist shareholder, Daniel Loeb. Target's (TGT) net fell 29 percent from a year ago and sales were a bit disappointing. The company also lowered its profit outlook for the full year. Home-improvement retailer Lowe's (LOW) came up short of expectations, as revenue was virtually flat. But homebuilder Toll Brothers (TOL) easily beat the Street. Net rose 46 percent and the company says orders for its luxury homes are rising, and so are the prices. After the bell, we'll hear from Hewlett-Packard (HPQ). Despite some lingering business problems, HP shares have soared 48 percent so far this year. Bristol-Myers Squibb (BMY) was upgraded to a "buy" rating by Citibank (C). It raised its earnings target for the drugmaker to well above the Street consensus. Ford (F) is planning to boost production to meet growing demand. The company will shorten its normal summer shutdown at some plants and speed up production at others. General Motors (GM) and Chrysler are also limiting their summer shutdowns. Netflix (NFLX) viewers can no longer get Sponge Bob or other programs from Viacom's (VIA) vast library. Their contract expires today. And the Federal Reserve could affect trading today. Chairman Ben Bernanke testifies on Capitol Hill about the state of the economy, and at 2 p.m. Eastern time the Fed releases its beige book report on regional economic conditions. CNN Money released its list of the 20 highest paid chief executive officers of 2012. It was refreshing to see some of the CEOs that have led their companies to long-term success made the list. Click through to see the top ten.